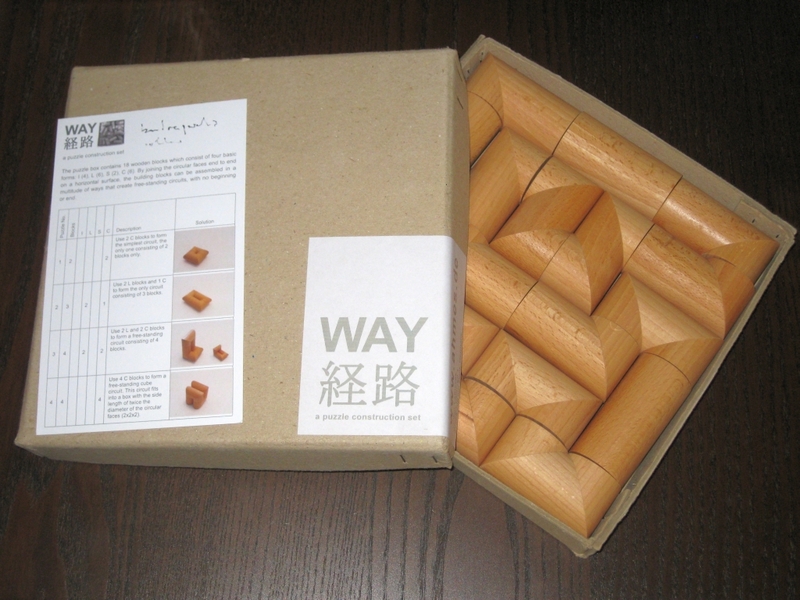 Way by Dr. Volker Latussek is an interesting wooden puzzle which was entered in IPP 31 Design competition in Berlin. Not long after IPP, I was talking with Volker regarding my thoughts on the puzzle, and he offered to send me a copy to play with. Shortly after our discussion a fairly large package arrived in the mail, and there was the copy of Way that he promised me. The goal of the puzzle is to create free standing circuits which form a single complete loop from start to finish, using the pieces noted on the challenge card. The circuit does not need to be flat on the table, and can be a three dimensional circuit. If fact, thinking upwards is needed to solve many of the challenges presented. 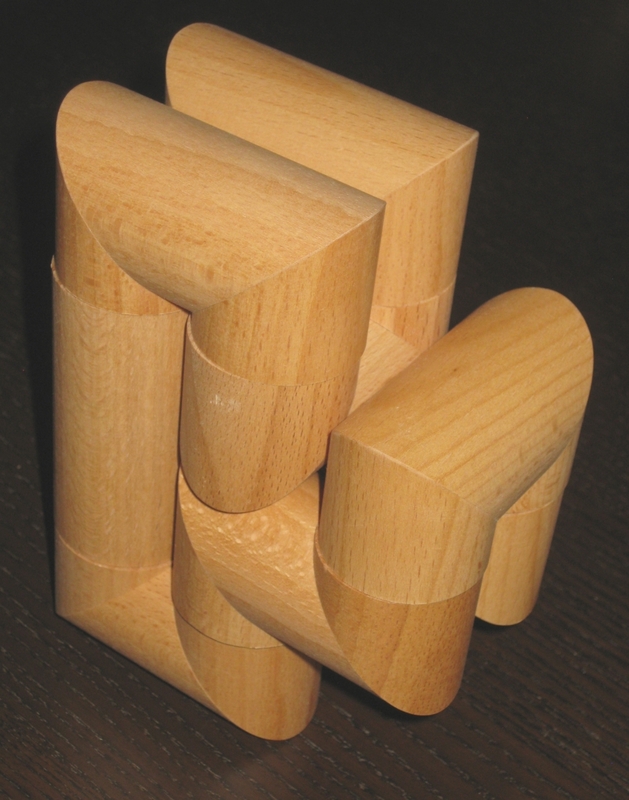 One of the unique points of the puzzle is that there are no pegs or magnets which hold the pieces together, and each of the solutions is stable when the correct solution is found. The first thing that struck me about this puzzle is the size. This is much larger than I was expecting from the photographs I'd seen. You'll get a feel for just how big the pieces are from the video (just excuse my gammy thumb). The pieces are all beautifully made, and perfectly smooth. Each of the oiled beech pieces has a good weight to it, and are all fairly large, even in my hands. The whole puzzle with all eighteen blocks measures 8" x 8" and each piece has a diameter of around 1.33". The puzzle comes in a heavy card box with the puzzle name on a sticker on the outside of the box. One of the challenges is even to fit all 18 pieces into the box in a continuous circuit (as opposed to just thrown in there as they normally are after playing with the puzzle). The Sticker on the box has the subtext "a puzzle construction set", and it does live up to that claim. It certainly reminds me of the building blocks I used to play with as a child when I was at my grandfathers house, although these are significantly less beat up than those blocks were! The puzzle comes with a challenge card with 8 different challenges on it, the first four of which are really showing you how to use the blocks, so contain a picture of the solution on the card. My biggest issue therefor is that there's only really 4 challenges provided with the puzzle to start off. For most people it's not going to take that long to work through the challenges. Visiting the website, there are now a total of 29 challenges which should keep you puzzling for quite some time, and it seems that more challenges are being added on a fairly regular basis. The most recent challenge was added on the 27th October (at the time of writing). The challenges are not all just 'build a circuit' challenges either. Some really need you to think about what you're doing by adding restrictions on the type of circuit. For example, the circuit must fit inside a 3x3 cube. As you can see from the image above, showing a few of the simpler challenges, it's possible to construct several of the solutions at the same time, and all of them are stable once complete. One of the issues I had was that the order in which you construct the solution is very important to the stability during creation. While it's true that all the solutions I have found so far are stable once complete, they're not always easy to build due to the nature of the pieces to roll. As you'll see in the video, removing one piece from the completed structure, and the whole assembly in many cases will fall down with a satisfying clunk as the pieces hit the table. While I love the fact that the solutions are all stable when built, I can't quite get past the feeling that having either the tiniest flat spot on the edges would help the puzzle greatly as the building would be less frustrating. That said, Dr. Volker is very proud of the design, and that the pieces are stable with no other aids, and I think he's right to be proud of it. Bottom line is that the way the puzzle is, there's an added dexterity element to the puzzle, which certainly adds to the challenge. Some of the more challenging puzzles really start to look like they're defying gravity with pieces hanging outside the main mass of the puzzle creating some interesting overhangs! Overall this is a really good puzzle, and if the challenges keep coming, then there's going to be a good reason to keep going back to it for some time to come. You can get one directly from Dr. Volker via the Way Website.